Argentina born structural artist Tomás Seraceno has an international following. From New York to Milan to Berlin, his installations are truly inspired architectural artwork. He recently moved on from bubbles and clouds to netting and the result at the Kunstsammlung Nordrhein-Westfalen K21 Ständehaus location in Düsseldorf, Germany titled "In Orbit" is loftier than any before. 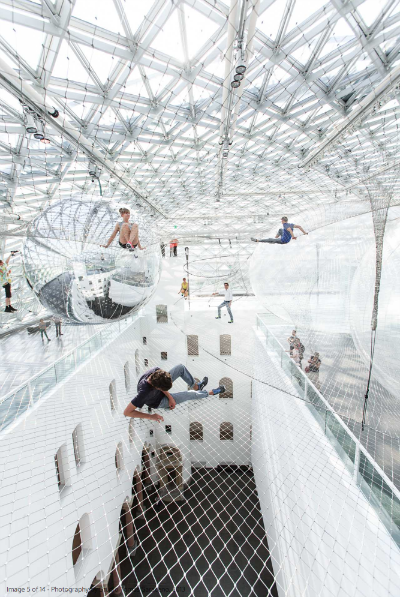 Saraceno re-imagines human mobility and living systems by applying his training in architecture with his understanding of aeronautics, chemistry, engineering, materials science, and physics. In his latest work, Saraceno also applied a bit of biology after consulting with entomologists about spiders and their webs to better implement his webbed netting concept that spans the building atrium 20 meters above the ground.